Hat trick for this week: My stitching update. I have two finishes this month. The first is for an ATC swap in the Cross Stitch Card and ATC group on Facebook. I stitched this on a 25-count opal Lugana I hand-dyed myself using a limited edition hand-dyed floss from Colour and Cotton. 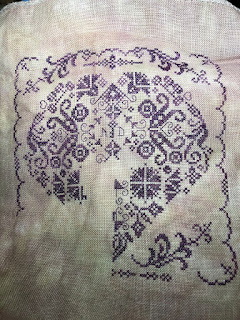 The pattern is from the 2016 Ornaments issue of Just Cross Stitch. This and a few other goodies will be shipping out to my swap partner this week. I also finished the December block for the Lakeside Needlecraft Under the Sea SAL. I stitched this on the custom-dyed fabric from Lakeside Needlecraft, which was a blue ombre' 25-count evenweave. I used the called-for DMC threads as well. Design is by Durene Jones. I swapped out the DMC Light Effects for a sparkly green blending filament I had, which worked MUCH better. I also used small clear opalescent size 12 seed beads for the water bubbles (rather than just DMC stitches). I have a frame on order for this which would hopefully be here next week! For the rest of the month, I'm going to be working on 3 pieces. First up, my Desert Mandala Chatelaine. Sadly, the designer of this piece, Martina Rosenberg, passed away unexpectedly yesterday - she was an amazing artist and she is definitely going to be missed in the community. I had this on tap to work on this week anyway, but it's a nice little tribute to her design skills to think of her while I stitch on it this week. I have the center medallion done except for beads, and I've started working on the next ring, which are various cacti. The colors are absolutely spot-on for the high desert! Finally, the Full Coverage Fanatics first quarterly SAL is kicking off on 12/21/2017. It's a winter-themed SAL that will run from them until the spring equinox on March 21, 2018. 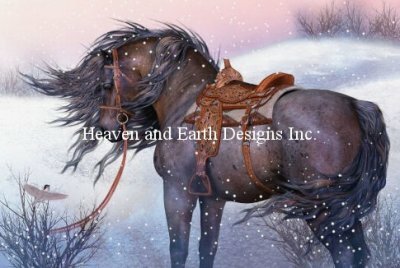 I'll be working on my Winter's Encounter piece, with artwork by Linda Prindle and charted by Heaven and Earth Designs. I had also started this originally during Stitch Maynia, but I was unhappy with my fabric choice, so I restarted it in October on 25-count Easy Guide and like that much better. I've only got about 500 stitches in so far, so I'll be working on the upper right-hand corner with all.that.pink for a while. 2017 Reading Challenge - FINISHED!